Designers working with the National Taiwan University Veterinary Hospital have found another application for the incredibly versatile 3-D printer: animal orthotics. In addition to an impressive repertoire of bicycles and one-story houses, 3-D printing is now also responsible for the leg brace that is helping Quack Quack the Duck (pictured on the left) recover mobility in his leg. 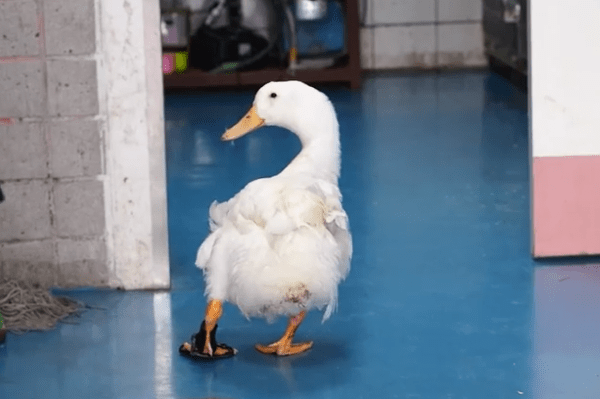 Quack Quack, who required extensive surgery on his left leg after being attacked by a dog, could not place weight on the injured leg after the operation. Design company Lung X Lung Design collaborated with Taipei Hackerspace to engineer a solution. The team crafted a customized leg brace using 3-D printing technology. After testing several prototypes, designers were able to construct a brace that was both lightweight and conformed uniquely to Quack Quack’s foot. The wounded waterfowl is now able to put weight on both feet, and is likely to make a full recovery. Three quacks for additive manufacturing!